As many of you know, I’m an election junkie; I just can’t seem to get enough of elections. So this past week, I’ve been able to drink my fill, with municipal elections throughout Ontario having taken place on Monday, October 25th. There were lots of interesting results on which I’d like to write about, but for the sake of time, I’m going to share my thoughts with you on the municipal election which took place in my home town of Greater Sudbury. Some quick background: Greater Sudbury has a 12 ward system, where one Councillor is elected per ward, and the Mayor is elected at-large. Our ward boundaries must be the most screwed up boundaries of any municipality in Ontario, however there is a reason that they are this way. Municipal amalgamation, forced on the former Sudbury Region and its 6 lower-tier municipalities by the Mike Harris provincial government required an “inside/outside” balancing act, due to the fact that the urban core of the newly created “Greater Sudbury”, the former City of Sudbury, had about two thirds of the population of the new municipality. The remaining one third occupies an area which today is often referred to as the “outlying areas”. However, this is not to imply that these are rural, ex-urban areas of the municipality. On the contrary, about half of the population in the outlying areas are located within smaller urban centres, such as Chelmsford, Lively, Garson and Conniston. Hence we have these crazy ward boundaries, which radiate outwards from the downtown core, almost like spokes on a wheel. Of the 12 Ward Councillors who have sat on Council for the past 4 years, 9 Councillors chose to seek re-election. Two Councillors decided not to run again, and one Councillor decided to run for Mayor. Two of the returning 9 Councillors faced no opposition, and were acclaimed. The Mayor of Greater Sudbury decided to run again. Therefore, at the municipal level, there were 11 separate contests, 8 of which included an incumbent (7 Councillors + 1 Mayor). Tuesday morning’s headlines in the Sudbury Star alluded to the circumstance which swept Mayoralty candidate Marianne Matichuk to power in Greater Sudbury: Sudburians wanted change, and we apparently voted for it on Monday. Matichuk, who was campaigning on the idea of “real change now” (as opposed to not real change at some indeterminate time in the future, I guess), convincingly defeated Mayor John Rodriguez. Rodriguez, who was the acknowledged frontrunner through the contest, lost by about 10% of the vote (Matichuk: 46.1%; Rodriguez: 36.4%). Ted Callaghan, the Councillor for Ward 8 who decided to run for Mayor, received 13.4% of the vote. The next best-finishing candidate was Derek Young, who received 2.6%. In the Wards, all 7 incumbents were returned; 6 by extremely healthy margins. One Councillor, Frances Caldarelli of Ward 10, was returned by only 5 votes. A recount has been requested by her rival, Fern Cormier, and by all reports Caldarelli agrees that a recount makes sense. Now it will be up to Council to decide whether a recount will occur (I expect that they will agree). Of the 3 wards without incumbents, two of those wards returned former Councillors to Council. Only Ward 8 can boast a brand new face on Council, with local business-owner Fabio Belli handily beating 8 other rivals in this empty ward. Official results are in the process of being announced, but the media is reporting that fewer ballots were cast in this election than were cast in 2010. Given that Greater Sudbury has grown by a few thousand people since 2006, it looks like voter turn out is likely to be down. I’ll admit that I’m surprised that this is so, even though in two wards, councillors were acclaimed. My surprise, however, is based on the very high profile Mayoralty contest which I’m about to tell you about. To me, it looks like a rather uninspired Greater Sudbury in fact returned tried and true hands to Council, and save for the Mayor’s position, the City opted for the status quo. I’m sorry, but I just don’t see the change which so many in my community are so very excited about. But of course, when a new candidate defeats an incumbent Mayor, it’s hard not think that maybe change is in the air. As far as the Mayor’s race goes, maybe there is some merit to it, as political outsider and relative unknown Marianne Matichuk threw her hat in the ring at the last minute and swept to victory over the existing Mayor, Rodriguez, and 17-year Council veteran, Callaghan. As far as Matichuk is concerned, it is fair to say that Greater Sudbury voted for something completely different. By vesting its votes in Matichuk, an unknown quantity, we’ll have to see just how much change we’ve actually voted for. However, Matichuk’s victory was clearly the only change Sudburians opted for on Monday. Why was this? Well, frankly, there are a couple of reasons. First, Matichuk ran a well-disciplined and organized campaign which did not rely on any grand visions. Instead, Matichuk rolled out a few populist and divisive policy concepts, including Boxing Day shopping (which, believe it or not, Greater Sudbury doesn’t have), a line-by-line review of the budget, and…well, I can’t actually think of a third. Oh yes, I can: one of her other priorities is to allow hot-dog vendors on the Jim Gordon Boardwalk at Bell Park. Clearly, for Matichuk, these were the issues which were burning in the minds of Sudburians which she wanted to address. 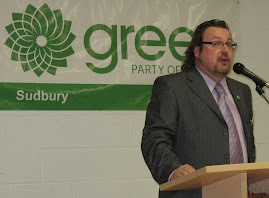 Matichuk offered a lot of empty slogans and ideas, such as “cutting red tape” and making Greater Sudbury more “open for business”. She offered very little for the public to get confused about regarding just how she would implement these ideas. However, she was successful in conveying the message that there’s a lot wrong at City Hall, and that she’s going to be the one to fix it. Sudburians apparently believed her, even without concrete ideas. She was very convincing. The tone of Matichuk’s campaign was almost entirely negative. She started out by attacking John Rodriguez’s record, and she finished up the same way. Her well-disciplined populist, vacuous, vision-less, negative campaign resonated with a great number of residents. I have to admit, as far as election campaigns go, Matichuk’s was masterful. I may not like this style of campaigning, but I can’t help but acknowledge that when done correctly, the successes can be significant. Given that hardly anybody in Greater Sudbury has ever heard of Marianne Matichuk before September, and that she’s now going to be our Mayor, the success speaks for itself. Matichuk, though, had three secret weapons: 1) the machine; 2) the media; 3) the Mayor. Let’s look at each in turn. Where did Marianne Matichuk come from? There were several rumours flying around the during election: some said that she was a front for Brazillian mining giant Vale, who purchased INCO a few years ago, and who kept its workers on picket lines here in Sudbury for over a year. Others suggested that the Conservative Party was behind her, both in terms of money and volunteers. Certainly her campaign manager, Paul Demers, has long been associated with the Conservatives, having run for the provincial Conservative Party in the Nickel Belt riding in the recent past. That she had a maching, though, was evident, because out of nowhere appeared large and professional signs, a slick website, and a social media campaign, run through Facebook, and the online comments section of the Sudbury Star. I also understand that she used new mass-dialing programs to connect with voters through the telephone. Slick brochures, skimpy on details and heavy on rhetoric and graphics, found their way into many blue-boxes. An active door-to-door campaign was also in place. These were all of the positives which her campaign machine engaged in. Interestingly, it’s worth mentioning a number of the things which her campaign chose not to do. Specifically, her campaign refused to engage in most special-interest events. In Greater Sudbury, a number of organizations asked candidates to answer questions in surveys, for later publication. One organization hosted an environmental-themed Town Hall meeting for Mayoralty candidates, where questions were to be posed to candidates based on their earlier responses to a survey. Matichuk and her team provided no responses to the survey, and skipped the town hall, indicating that she was double-booked. She also avoided surveys conducted by the Sudbury Cyclists Union, and failed to take the Coalition for a Livable Sudbury’s Sustainability Pledge. Clearly, there were a number of issues which Matichuk was not going to offer an opinion on (and yes, I include environmental issues here, despite her releasing her Green Vision for Greater Sudbury on the same evening as the Good Green Town Hall; this “vision” was so narrow in scope and focussed on economic benefits as to be, in my opinion, greenwashing in the extreme). She took this avoidance further. I attended the Greater Sudbury Chamber of Commerce’s All Candidates debate. When confronted with questions relating to lake stewardship, urban sprawl, youth employment and homelessness, she was either at an almost complete loss to sound coherent, or deftly deflected the issue so that she wouldn’t have to say much about it. One question sticks out in my mind. She was asked, “Ms. Matichuk, you have a lot to say about Boxing Day shopping, but what about the plight of the homeless here in Sudbury? Don’t you believe that homelessness is a much more important issue for Sudburians?” She answered, “Yes, I do.” And then she proceeded to spend the next minute and a half talking about Boxing Day shopping! However, from a campaign perspective, these avoidance techniques can be considered masterful. If she doesn’t say anything about something, she certainly couldn’t be challenged by the other candidates! And since social, environmental and youth-related issues simply were not on the minds of most Greater Sudburians, what did she lose by remaining silent? Nothing. Nil. I think it’s fair to say that most Sudburians who identify those issues as being more important than roads and taxes likely weren’t going to vote for Matichuk anyway. So Matichuk chose the right focus for her campaign: taxes, and to a lesser extent, roads (which was also smart of her and her team: by saying little about what she will actually do about roads, when she, too, fails as Mayor to have any impact on road quality, at least the public won’t be able to point to her and say, “But you said that you were going to do this…”, naming a specific remedy. Rodriguez, when running for Mayor in 2006, insisted that he would get the snowplows to raise their plow at the foot of driveways. He never delivered. It was an election issue). While not officially part of the Matichuk Campaign Team, our local daily, the Sun Media-owned Sudbury Star, bent over backwards to provide her with the kind of coverage that most candidates can only dream about. Now, I’m not suggesting that this was necessarily because of a convergence of right-wing views (Matichuk’s and the Star’s owners), although I’m not going to rule it out either. Maybe she received such extensive and positive coverage because she was the only candidate to actually go out and make news. She did this largely by attacking John Rodriguez, often with the pointed quips which made for good soundbites on the radio and TV. Since our local media decided for the most part not to cover the Ward races (and since there was very little to cover there anyway – more on that later), this left the media to focus on the Mayor’s race. Although there were 8 names on the ballot for Mayor, two individuals did not campaign and 2 others were perennial fringe candidates. That left a field of 4 for the media to cover, which still was apparently too large for most of our local media outlets. 32 year old Derek Young, who offered a concrete vision and fiscally-responsible platform to voters, had a very difficult time getting much coverage at all for his campaign. Interestingly, both Young and Matichuk were relative unknowns at the outset of the election, although Matichuk received all kinds of coverage and Young was written off as a non-entity (actually, Young had a much higher community profile than Matichuk, as he had previously run for Council, owns a local downtown business, and is involved in organizing community events such as the Celtic Festival). When Ted Callaghan offered an incredibly lack-lustre campaign, the media decided to turn things into a two-horse race. Callaghan, who ran a subdued “what you see is what you get”, sincere campaign which offered a good mix of vision and prudence, just couldn’t break through the momentum of Matichuk’s campaign of negativity. With about two weeks to go, Callaghan was written off, and polls showed his support plummeting, including falling 11 percentage points in the final week. Given that Callaghan had positioned himself to receive the right-wing, anti-Rodriguez vote, it’s fair to believe that most of his supporters abandoned ship for Matichuk. After endorsing the unkown Matichuk for Mayor on the Friday before the election, the Sudbury Star published a very strange story in its Saturday edition, about how Council expensively bungled the letting go of a manager four years previous. Apparently, this story was based on information the Star had received in a brown envelope earlier in the week. As near as I can gather, the accusation was that when this manager was let go, he was given a golden handshake. Certainly that’s not new in Greater Sudbury (remember Mark Mieto? ), or in most municipalities when employees are let go prior to their contracts ending. This often happens when a new Council comes in and wants some new faces in the bureaucracy. Why this should be front page news 4 years after the event happened can only be attributed to the fact that there was an election on. Yes, I clearly believe that our local daily was biased in its coverage of Matichuk throughout the entire campaign. I do not believe it was collusion, but rather a happy coming-together of circumstances: a right-wing, newsmaking campaign and a right-wing newspaper unhappy with the current left-wing mayor, who had certainly done a lot to frustrate that newspaper’s reporters in the past four years. I like John Rodriguez. Other than Derek Young, he was the only candidate who offered Sudburians much in the way of a vision for the City, even if only tepidly so. The fact is, the concept of vision isn’t what voters here are looking for. This was shown to Rodriguez time and again throughout his past four year term. Coming into office four years ago, Rodriguez wanted to create a couple of massive “legacy projects”: a multi-pad arena and a performing arts centre. After much acrimonious debate, focused on price and need, these projects were killed by Council. Much of the debate centred on the argument that the money would be better spent on improving our roads, or returned to the wallets of taxpayers. Rodriguez also stepped into it big-time with the Elton John Ticket Scandal. I won’t go into specifics here (there’s probably a whole page about this on Wikipedia), but I have to say that this scandal was a significant blow to Rodriguez. He was repeatedly forced to acknowledge his mistakes throughout the campaign. Rodriguez heavily favoured the Union during the Vale strike of 2009-10 to the point that many Sudburians deeply questioned whether or not his lack of neutrality was a good thing for our community. Clearly, Rodriguez was a wounded incumbent Mayor, and a polarizing force in the City. Ultimately, this paid off for challenger Matichuk. When it became clear that Callaghan wasn’t going to be a force in the election, all of the local opposition to Rodriguez fused into support for Matichuk. And that’s what her campaign had counted on all along. Most Ward Councillors simply didn’t show up to campaign. Yes, sure, there were signs (and lots of them! ), but as far as door-knocking, flyers, phone calls etc. were concerned, the incumbents largely sat things out. Many didn’t respond to surveys from local organizations. They received little or no media coverage. Only Frances Caldarelli was actively campaigning for her seat. Yet all of the incumbents were returned with large majorities, except for Caldarelli! What happened? A lack of well-financed campaigns on the part of challengers was likely the reason for the immense silence from incumbents. Only Liberal Fern Cormier was able to offer anything resembling the sort of campaign needed to capture a seat at the Council table. Money and volunteers were present for Cormier, and noticeably absent for almost all of the other challengers. Now, this isn’t to say that there weren’t some innovative and inspiring campaigns by some of the challengers. Peter Albers in Ward 2, Richard Paquette in Ward 4, Christine Guillot-Proulx in Ward 6, Gordon Drysdale in Ward 7, Fern Cormier in Ward 10 and Jeff MacIntyre in Ward 12 (along with Tom Fenske in Ward 11) were all over the internet, using social media tools to engage the electorate. Pacquette in particular tried to break through into the mainstream media, experiencing some successes (particularly when he was criticizing his opponent, incumbent Evelyn Dutrisac). Largely, though, the campaigns run in the Wards were positive affairs (including Paquette’s), based on ideas, vision, and the need for better communication. Hmmm…is it any wonder that of all of the names I’ve identified here, only one is over 40 years old? Anyway, it’s fair to say that these sort of positive campaigns did not resonate at the ward level. They also received little in the way of media coverage. Only when Paquette was on the attack, or when a number of these candidates banded together to issue a joint press release criticizing absent incumbents by describing their election experience as being akin to “campaigning against ghosts” did they receive much coverage. Just some really quick comment on the wards which lacked an incumbent. Two of those wards were contested by individuals who previously been on Council (in fact Ward 11 was contested by two former Councillors). In both of those wards, the former Councillors were returned. In the other ward, Ward 8, newcomer Fabio Belli handily defeated a handful of other newcomers. I recall telling my wife back in late August that Belli was going to win. Not that I knew anything about Belli at that time. But Belli had one thing going for him which was a masterful stroke as far as campaigns go: he had printed up coloured signs with his picture on them. Ward 8, without media coverage, without any well-known names, and with a plurality of candidates in the running, was going to be won on the basis of lawn signs. That was my conclusion in late August, and based on the outcome, I continue to stand by it. I think it’s important for Greens to learn some lessons from this municipal election, although clearly not all lessons are going to be translatable to provincial and federal campaigns, given the differing dynamics which leader-based party politics brings. However, a few things are worth pointing out. First, when an incumbent has a certain strong core of support, as did the NDP’s John Rodriguez, where that figure is also a polarizing force, there exists an opportunity for exploitation. The question then becomes how best to exploit it. A strong incumbent is going to be difficult, if not impossible, to knock off anyway, especially if they haven’t done too much to engender the wrath of voters. Here in Sudbury, Rodriguez was a wounded force with strong backing. The lesson to take forward here is, I believe, the following: give the voters what the want, and no more. Campaign hard, smart and negative: go after your intended victim, and draw only that attention to yourself which is based on your strengths. Stick to your core messaging at all costs. Repeat. And repeat again. Make sure you have a lot of money. Make sure you have a good number of volunteers. Make sure you plant a lot of good-looking lawn signs. Make sure that you are ready to exploit the anti-incumbent feeling of the electorate to your advantage: when the vote begins to collapse for your opponent, make sure that you position yourself as the only one able to defeat the incumbent. And make damned sure that the local media knows who you are, to the point that you must become the newsmaker. Do not rely on press releases, policy discussions or grand vision to achieve the status of media darling. You must give the media what it wants: a really good story. Does that sound cynical? Absolutely. Clearly, it’s not going to be the strategy to employ in all cases. And it’s certainly an electoral strategy which is alien to the vast majority of candidates who carry the Green banner at election time. But, look at what negative campaigning achieved here in Sudbury (and in Toronto, and so many other places). Here in Sudbury, an unknown individual quickly became the media’s darling, because she had the audacity to make news by calling her opponent names and trampling his record in a very public way. This media coverage boosted her fortunes considerably. For me, the best comparison in the Mayor’s race was not between John Rodriguez and Marianne Matichuk; rather, it was between Marianne Matichuk and Derek Young. Young tried to campaign on a shoe-string budget while offering concrete yet realistic plans and a vision of a better city. His idealism was ultimately his downfall. By offering voters real leadership and a chance for significant change, his message was one which would not and could not resonate here. Does that sound familiar, Greens? Matichuk, also an unknown, followed her script very well, used her resources to run a smart campaign, and roasted the unsuspecting and ill-equipped Rodriguez over an open fire. The momentum she exhibited throughout the campaign was a wonder to behold. Greens, we need to take these lessons seriously, as much as they are offensive. We need to be looking for opportunities where we can apply these lessons (because clearly, we’re not going to find them everywhere; in circumstances where we have to rely on our ability to “come up the middle”, a more visionary campaign might be the order of the day. Look no further than Naheed Nenshi’s recent victory in Calgary). Where there is a wounded incumbent in play, however, negative campaigning is likely the way to go. Would we risk alienating our own core voters in the process? Can Greens afford to go negative when we can’t even communicate our core values and policies to the electorate anyway? I believe that the answer is yes, because part of the advantage of negative campaigning is that you don’t really have to say much about yourself and what you stand for (Matichuk certainly didn’t). Just as long as you get coverage in the media, things will likely work out. The degree of negativity need not be that significant (even Matichuk’s negative campaign paled in comparison to many campaigns that I’ve seen in Canada and especially the States), but it needs to be present. I suspect that even Shane Jolley might have questioned Bill Murdoch’s record once or twice during his provincial campaign back in 2007; goodness knows, there was a lot to question! I draw this parallel not to suggest that Jolley engaged in negative campaigning (because by all accounts, Jolley's message was one primarily of vision and change), but rather because the circumstances in which he fought his campaign, deemed to be one of the most successful Green campaigns in Canada, mirror those circumstances that I’ve described here in Sudbury, especially with regards to Jolley’s use of the mainstream local media. In a tight two-way race, you’re going to have to mix it up. It’s the getting to the two-way race where, often, negative campaigning helps. I appalled with my own analysis here. It goes against so much of what I believe politics should be about. But it’s very hard to ignore these obvious lessons, as much as they might gall us. I couldn't agree more Steve. Understanding political strategy is necessarily Machiavellian; and why keeping an over all vision of what we truly want is so vital. Keep things in context. After all, one of the changes we want to see is a shift in the political discourse itself.